Contrasts the frequently-overlooked educational goals of students with the expectations of institutions. 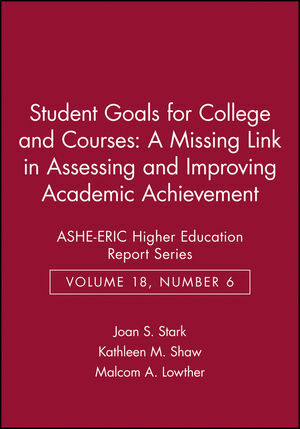 Views goals in terms of specificity, clarity, source, commitment, and temporality, and demonstrates frameworks and uses for course-specific goals inventories. Joan S. Stark is professor emerita in the Center for the Study of Higher and Postsecondary Education and dean emerita, The School of Education, University of Michigan. She is the former editor of The Review of Higher Education and the former director of the National Center for Research to Improve Postsecondary Teaching and Learning, a national research center funded by the U.S. Department of Education. She is the author or editor of numerous books and monographs including: Reflections on Course Planning, Student Goals for College and Courses, Planning Introductory College Courses, and Assessment and Program Evaluation.